Are you facing any issue with Internet Explorer? If yes, then its time to repair Internet Explorer for smooth web browsing. We have already seen Repair IE utility to fix and repair issues with Internet Explorer. Fix IE is another utility to keep Internet Explorer is good shape. This tool re-register around 89 dll & ocx files, which are required for the smooth running of Internet Explorer. 1. 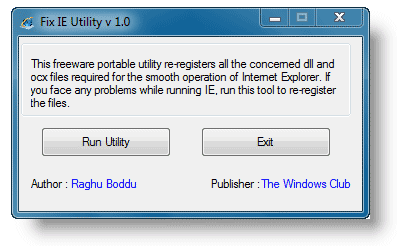 Download Fix IE utility [weblink] & unzip. 2. Double click to launch utility (no install is required). 3. Click Run Utility button & you are all set to repair IE. This utility changes registry, you can backup registry or create system restore point to revert changes. Also, make sure Internet Explorer window(s) is closed while running this utility.